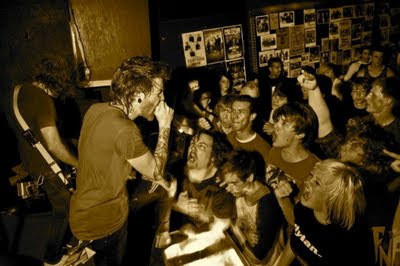 Please Date My Music: Post #189 - Memphis May Fire - "The Victim"
Post #189: I am super pumped for tomorrow evening, as I will be heading to Downtown St. Paul and Station 4 for a low key and laid back show by Memphis May Fire. If you have already started the video, then you know I am being sarcastic. As I mentioned in a previous post I did in April HERE, I had a chance to see these guys at the beginning of last year as an opening act. This show will be anything but low key. Their second full length release, The Hollow, hit stores at the end of April, which is where you will find "The Victim". With 5 opening bands, the doors are opening pretty early at 5pm. But the nice thing with an all ages show is that I should be home and in bed by 11pm. Looking at the above picture from their Facebook page, makes me super excited to get some video and pictures of my own, which I will have up before the end of the week. Hopefully my camera can make it through the moshing. Memphis May Fire, "The Victim"